is based on a close and trustful relationship to our customers, suppliers and distributors, a rounded up pump program with first-class quality at an attractive price and motivated employees who are working with us since many years and have experience in pump business since many decades. When we talk about our business philosophy we have to talk in fact about our customers and employees. Their expectations and long-term satisfaction are the epicentre of all our actions. 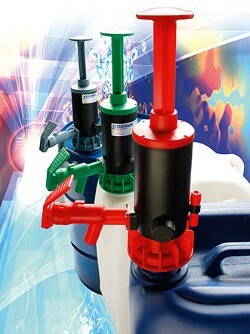 Primarily we want to have satisfied customers and despite our company growth we still want to be able to take care regarding the needs of each customer – independent from the circumstance whether he needs only a spare part or a hand pump or has a larger and regular demand for pumps. A continuous training and further education of our commercial employees and blue-collar workers in our assembling and production area ensures that they can develop freely. Regular meetings of our department heads and discussions of the company owners with their workers are helping them to identify with their daily work and the goals of our company. As a family owned company we attach in all our actings with our customers, suppliers, employees and sales partners a great importance to fairness, partnership, sustainability and reliability. Since the beginning of our own activities in 2003 our company has been certified conform to the quality management system ISO 9001. The expected quality by our customers has become the measure of quality in all sections of our company. Quality means for us to know the defined needs of our customers, to realize them in an optimal way in our internal procedures and processes, and to fulfill them in respect of the success of our company and the environment. The pumps we produce in that way can therefore be delivered in our usual quality and reliability to the end users or distributors. By shifting the responsibility for the quality of our products on the respective areas of responsibility we want to ensure that errors are avoided already there where they may occur. The company’s management and our executive managers bring forward with such personal measures the awareness for quality and environmental at all sections and motivate their colleagues to personal responsibility and environmental awareness. Continuous controls, the transaction of internal audits and subsequent improvement processes ensure a maximum flexibility in all areas of our company and a consistent high quality of our products. In addition we inform our employees about all internal and legal changes and innovations. 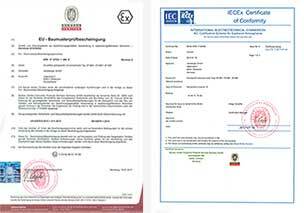 Beyond the requirements of DIN EN ISO 9001:2008 and ATEX 2014/34/EU we observe the applicable laws and regulations. Within the bounds of our opportunities we strive for an economically reasonable and environmentally friendly acting. Regarding the production of our drum pumps and development of new products we are guided by state-of-the-art of science and technology and the latest cognition of our research and development department. Although our company is not certified to ISO 14001 the protection of the environment is an integral part of all our actions. In order that our living space remains attractive also for future generations our employees and we effort for the greatest possible protection of the environment and a conscious use of natural resources. We believe that an environmentally friendly action is as important as the economic growth and success of our company. Respecting other people and the environment as well as an absolute quality awareness shape therefore our activities.